It didn’t surprise him that she screamed and begged for her life, even though it was pointless. He hadn’t gone to all the trouble of luring her over, slapping a rope around her neck, and dragging her into the Escalade for no reason. 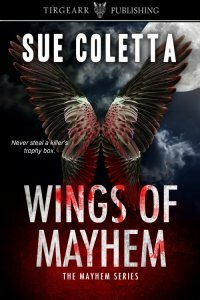 Beth Cook thrashed in the restraints, shaking the metal table on its wheels. With an indelible black marker, he drew dotted lines around the shoulder joints, neck, where the thighs met the hip, and a Y from collarbone to collarbone with one long line down the sternum to the navel. He’d braced the woman in an upright position so he could work from front to back without having to flip her. Once he carved along the dotted lines, he peeled the skin while chiseling away the meaty flesh underneath. Blood spilled into the crevice around the table’s edge and dripped onto his leather loafer. “Now look what you made me do.” He set down the scalpel and darted into the kitchen, where he sponge-washed the loafer in the sink. Blood-curdling cries ricocheted through the house, triggering the dogs to belt out long, steady bays. As usual, Apache was the loudest, his howl coiling through the hardwood floors. “That’s my boy,” he muttered, scrubbing the loafer with dish soap and an all-natural sponge, not those cheap ones that ruined the environment. Soap didn’t work. He dragged a gallon of bleach from under the sink. With a folded paper towel, he dabbed the stain. The nutmeg leather faded to creamy beige, but at least the blood disappeared. On the way back to Beth Cook his foot squished and squashed and left a trail of wet shoeprints. Now he’d have to polish the floors, too. Murder was much harder than it looked in the movies, but he’d do anything for her. Hours later, he pulled in front of the Methodist church and hopped out the driver door. From the back, he dragged Beth Cook, her corpse wrapped in plastic so as not to stain the interior. In front of the church steps, he posed her in a kneeling position, hands held in prayer. Blood dripped off the glorious wings he’d created from her ribcage. A flawless design with only the face left on the body, the rest of her skin-free. A solid hour later rigor mortis finally set in and preserved the pose. So she wouldn’t topple over he tied ropes around her waist, braced her body between two trees. One final touch. He stuck a black feather between two of the ribs jutting from her back, and then escaped the scene clean. Shame he couldn’t witness his reaction.